Great news for TeamDrive in the first week of the new year. 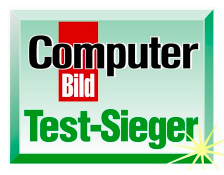 Computerbild, the largest computer magazine in Europe, voted TeamDrive as the best online sync tool. It is an encouraging result in a very competitive environment and a great motivation for the hole team to work hard to expand that position with our new upcoming releases. The competition to TeamDrive in the test where Microsoft LiveMesh, Wuala and Dropbox. As the smallest company in this field we need to spread the word and continue to grow our recognition in the market.